An inquest into the 27-year-old singer's death was told she had 416mg of alcohol per 100ml of blood. The driving limit is 80mg. 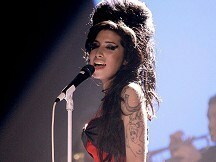 The hearing was told the Back To Black star had not had a drink in July before hitting the bottle on Friday July 22. She was found in bed in her Camden home in north London the next day. The inquest heard her security guard looked in on her at 10am the day she died but left her for five hours before calling the emergency services. The live-in guard, Andrew Morris, said he thought she was asleep when he initially checked on her but at 3pm he checked again and she had not moved.